via Healthy Tips When Eating Out. Olive oil and restricted diets: which type is best for you? You’ve been told olive oil has good fats not the bad fats in everything else you once loved to eat but no longer can. So are all olive oils created equal? I recently visited an olive oil processing plant in southern Italy while on a 10-day vacation with family there. The owner, the fourth generation of her family to run the place, explained to us that extra virgin olive oil is best when watching your cholesterol and diet overall. 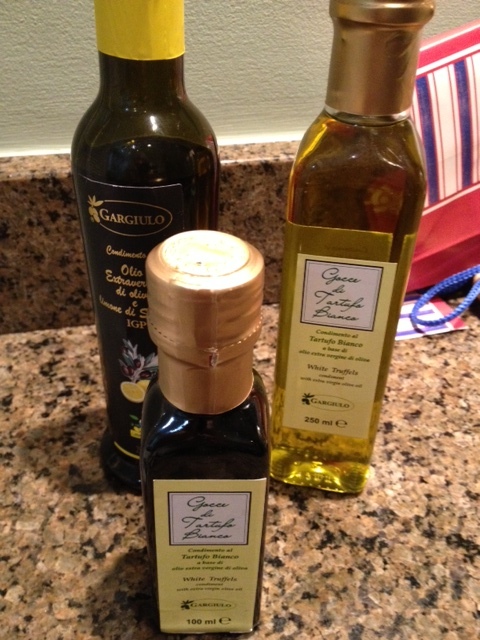 some of the amazing olive oil we brought back from Italy. We sampled a wonderful array of oils there. I have always loved olive oil. Tasting it in my ancestral homeland was even more special. While I can’t eat plain Italian bread any longer, I can always buy some type of whole wheat bread to dip in my wonderful olive oil. And putting it on vegetables and fish adds a wonderful flavor. I also use it exclusively on salads now, having walked away from any type of prepared – read high-fat, high-salt – dressings. Interestingly, in Italy no restaurant offered any type of prepared dressing. Oil and vinegar were routinely placed on our tables instead. I wish American restaurants would copy that practice as well. 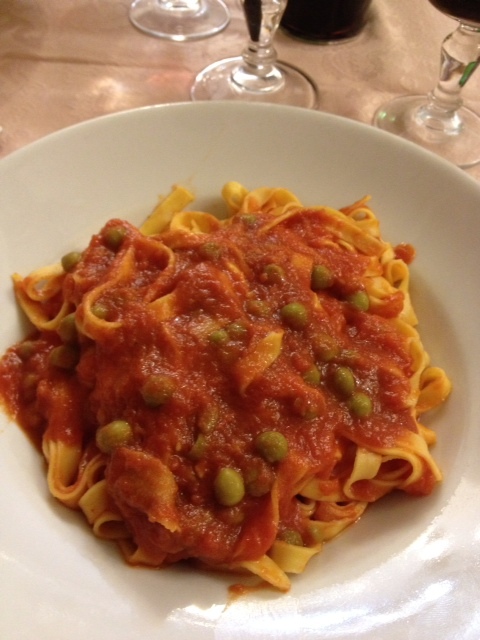 My recent trip to Italy included some amazing meals, made all the better because they were shared with family. And both hotels we stayed in offered breakfast buffets. Buffets hold a certain magic for me, having grown up with very little. An all-you-eat buffet seems the opposite of a childhood spent on the edge of poverty. But these days I cannot partake of all the wonders a buffet offers and breakfast buffets are no different. Our hotel buffets had the usual bacon, omelets and other items I can no longer eat. But thankfully, they also featured a variety of fruits which is where I spent my time at them. You are planning a dream vacation and wondering how you’ll be able to try adventurous new dishes while staying on the restricted diet you’re now on because of heart disease, diabetes, obesity, gout or any of a number of other ailments. The simple answer is that you’re going to go off your diet while on the road. I just completed 10 days in Italy, a trip to find my family’s roots that I had been hoping to make most of my life. And while I passed up many dishes I would have liked to eat, I still went off my restricted diet. I ate pasta almost every day. I ate gelato every other day. And I ate desserts like wonderful chocolate cakes, something I largely have not eaten since my angioplasty in August 2012. 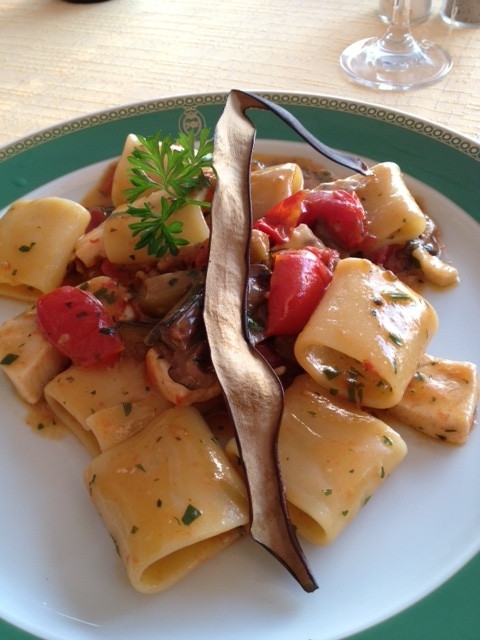 One of the many wonderful pasta dishes I ate in Italy, none of which is allowed on my restricted diet. 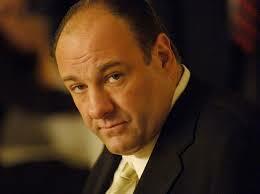 Did James Gandolfini Die of a Heart Attack? I was shocked this evening to hear news of Soprano’s star James Gandolfini dying in Rome, apparently from a heart attack. While I normally blog about food, diet and job hunting, I have to dep­art from those topics today to warn you against flying on Air France, ever, under any circumstances. A recent Air France flight I took from Paris to Chicago was the worst, I repeat the worst, flight I have experienced in 42 years of commercial air travel. My wife and I sat in row 29 of an Air France A 330 Airbus, across from an exit door but not next to it with the added leg room that would have provided. Instead, we were up against a wall which meant zero leg room and constant cramps in both my legs. But the discomfort only began with that. The temperature in our seats easily approached the freezing point and there was no way to control the airflow around us, no knobs to adjust the air conditioning. 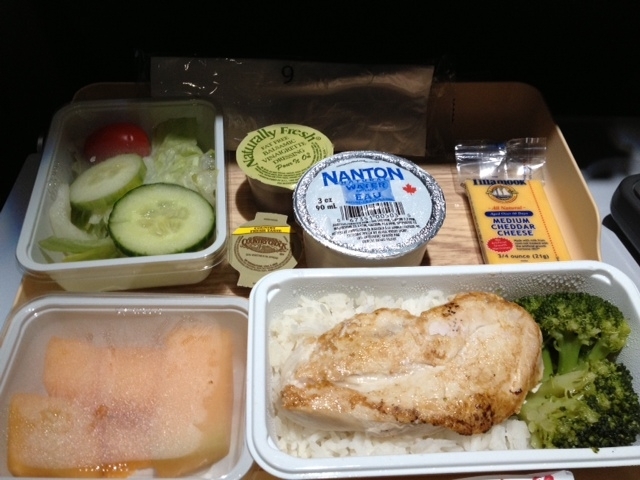 A low-salt airline meal on Delta…cheese, salad dressing, white rice? Really? Why aren’t grilled vegetable plates common in America? While it’s been impossible for me to maintain my restricted diet while on vacation in Italy this past week and a half, one pleasant menu surprise here is that nearly every restaurant, large and small, has a plate of grilled vegetables on its menu. On Thursday, we stopped at a tiny, nondescript place that likely would be thought of as a greasy spoon in the States, only to find a menu full of salads and sporting the ubiquitous grilled veggies, which I ordered. 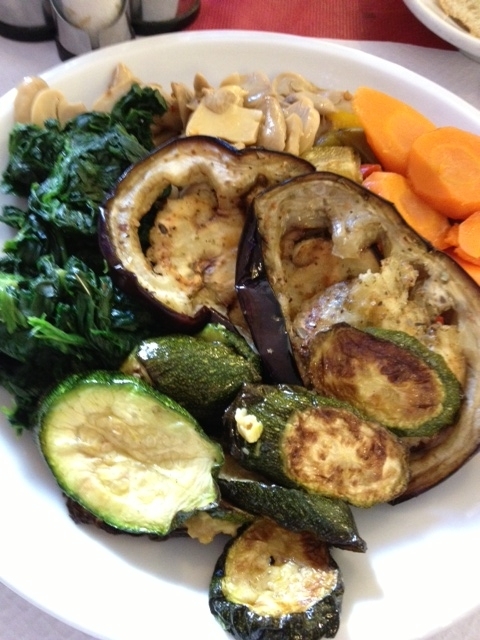 What I received was delightful, including eggplant, squash and even some spinach along with mushrooms and carrots, all grilled without any harmful sauces and what seemed like very little salt. Veggie plates are common in Italy, why can’t U.S. places offer the same? Can you stay on a restricted diet in the land of pasta and seafood? I’ve been doing my best since I arrived in southern Italy to eat the way I’m supposed to on my restricted diet but doing that is proving impossible. I cannot avoid pasta here and I can’t find whole wheat pasta which is the only type I am supposed to eat these days. What I am doing is eating smaller portions of pasta than would be served in American restaurants. Portions are smaller here because places serve the traditional Italian multi-course dinners. In those the pasta course is just a prelude to the fish or meat course and so not massive in size. What’s an airline no-salt/low-salt meal like? As I began my vacation, I was trying to stay on my restricted diet by ordering a special meal for my flight to Italy. Delta, as do most airlines I think, allows you to special order all sorts of meals ahead of your flight. I visited its website a few days before our departure and asked for a no-salt/low-salt meal. What greeted me on the plane reminded me why I don’t miss airline food on domestic flights. The meal I received included a bland chicken breast and white rice (which I’m not supposed to eat, only brown rice is allowed by my nutritionist). The small salad came with a dressing that likely had salt so I left it. A piece of cheese, something else I can’t eat because of fat and salt, also was included. Really? Cheese on a low-salt diet? Salad dressing on a low-salt diet? If this was any indication what was ahead for me, I was in for a long trip. 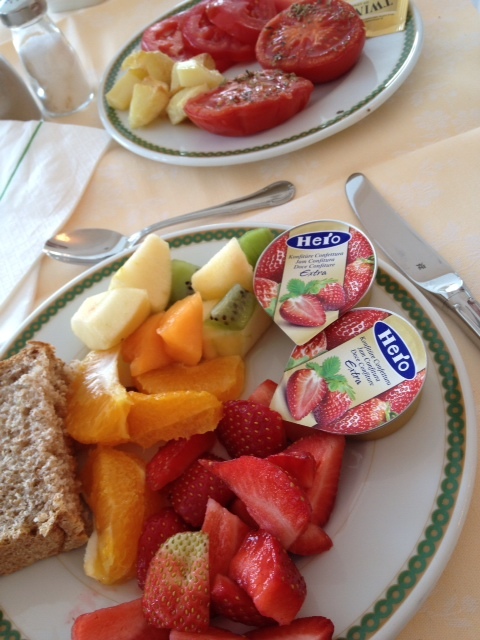 Luckily, since we have arrived in Italy, the food choices have been much more varied, and enjoyable for me. Keep reading to see what I’ve been eating in the land of my ancestor’s birth.